Plato is the lava-filled remains of a lunar impact crater on the moon. It is located on the northeastern shore of the Mare Imbrium, at the western extremity of the Montes Alpes mountain range. In the mare to the south are several rises collectively named the Montes Teneriffe. To the north lies the wide stretch of the Mare Frigoris. East of the crater, among the Montes Alpes, are several rilles collectively named the Rimae Plato. 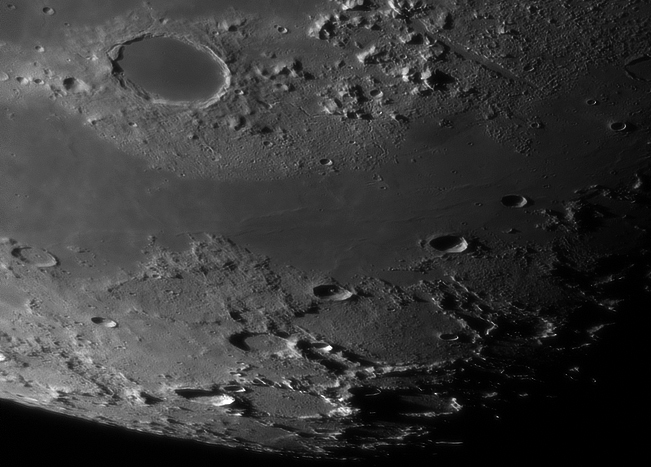 The age of Plato is about 3.84 billion years, only slightly younger than the Mare Imbrium to the south. The rim is irregular with 2-km-tall jagged peaks that project prominent shadows across the crater floor when the sun is at a low angle. Sections of the inner wall display signs of past slumping, most notably a large triangular slide along the western side. The rim of Plato is circular, but from the Earth it appears oval due to foreshortening. The flat floor of Plato has a relatively low albedo, making it appear dark in comparison to the surrounding rugged terrain. The floor is free of significant impact craters and lacks a central peak. However there are a few small craterlets scattered across the floor.